Every Monday morning, while elementary school, Sherman rode his horse down to the Grammar School in Frelighsburg. Both he and the horse boarded in the village until Friday afternoon, when they rode back up Joy Hill to home. The Grammar School was where he met Norma Whitcomb. By the time he was twelve, he was carrying her books home every day. Ten years later, they were married in the lovely old Bishop Steward Memorial Church. Later, he purchased the farm from his widowed father, Robert, who moved across the road into the hired hand’s house. took off from school a little too quickly. Her son son, Robbie, along with the back seat, fell out the back door, into four inches of slush. Sherman finally gave up his bus route in the 1980’s. It was a loss to the parents who entrusted their children to him. They knew they would be brought home safely over mountain roads in all kinds weather. He missed the kids. Today, Rob continues the tradition with his partner, Eliza Rhicard. Soon after acquiring the farm, Sherman converted his mixed herd to Guernseys. He preferred them for their rich milk, sweet nature, and soft red and white colouring. The family knew that the butter they churned had no equal. Sherman chose to fence his entire 220 acres to ensure that the brush was controlled, both in the meadows and in the sugar woods. The pasture ran half way up the Pinnacle. The sight of his herd grazing up there on a fine summer day caused more than one passerby to stop on the highway. By the 1960’s, Sherman was renowned as a Guernsey judge, from Sherbrooke Fair to the Royal and the CNE in Toronto. Over the years, Pinnacle Mountain Farm won two All-Canadian Guernsey, and two runners up – four separate animals. In the ‘70’s, his son Russ won 1st at the Royal for his 4H calf, and fetched a record price of $2300. But what Sherman liked, best of course, was showing his beauties at home, at Brome Fair. Duchess was a favourite. She was purchased from the Experimental Farm in Ottawa and is remembered at the Fair for seeking out the cameras by poking her head into the children’s photography tent. Another exceptional critter, was Bliffer, a cantankerous little bull, who held eight-year old Rob against the barn wall between his horns, until Sherman struck him (Bliffer, that is) repeatedly with a shovel. Bliffer got his own back in the Grand Parade by lying down in front of the grandstand and making the exhibitors behind detour around, while Sherman waited patiently for him to get back up. It was thought that the heat that day might have exacerbated his fatigue after a morning of earnest breeding. By the mid-seventies, hunters from outside the area had migrated to the game-rich flanks of the Pinnacle. They hunted at night with powerful lights, sometimes from their cars. In those conditions, the shining eyes of a deer were indistinguishable from those of a cow. Pinnacle Mountain cattle were being butchered in farmers’ fields. Sherman and several neighbours founded the Sutton Fish and Game Club. They trained and certified wardens, instituted patrols, and saw to the prosecution of invading poachers. Soon local landowners signed up to have their land posted and patrolled, and a measure of control was returned. But not without Sherman, and others like Rolly Goodhue, having occasionally to face down a pointed gun. The end of the season was marked with a bountiful game dinner at the Horizon Hotel. In 1960, Sherman was elected a municipal councilor in Frelighsburg Township (the Canton), and in 1968 he was elected Mayor. Changing times caused him to resign in 1974, when he was no longer permitted to recite an introductory Lord’s Prayer in his mother tongue. During his term, he was proud to have cast the deciding vote in favour establishing the precursor to Camp Garagona, – The Brome Mississquoi Camp for the Mentally Handicapped. He was sympathetic to that cause, having known an uncle from each side of his family, who would have benefited from that exceptional institution. 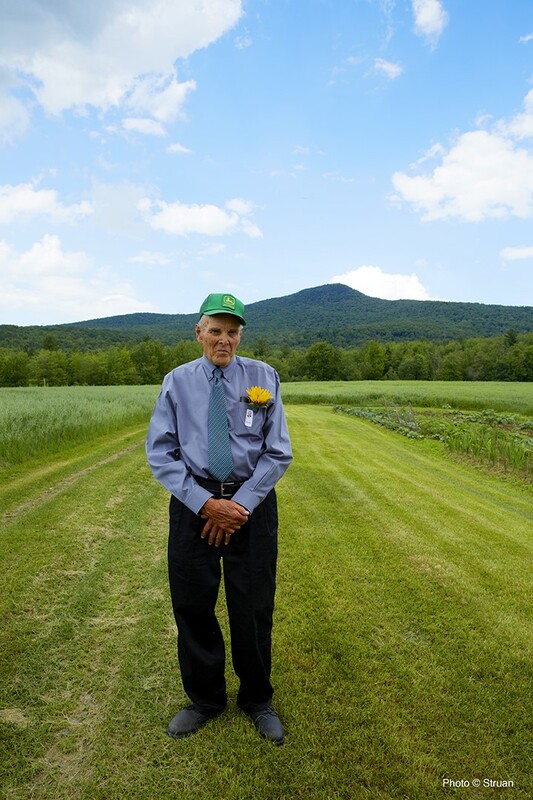 Through all those years, Sherman sold his 10’ sunflowers, squashes, pumpkins, and home-made straw brooms from his stand. While a shy man, he loved people. The stand offered him the opportunity to visit with many annual returnees. With all that, he was unswervingly faithful to the preservation of neighbouring cemeteries, and, from day one, The Townshippers Association. He marked his devotion to his country by acutely following the news of the day, from local to international, and by an active involvement in the federal and provincial Liberal Parties. He held respect and affection for all elements of his community. Although he was a man of few words, each one counted. He could hold his own in worthwhile discussion with the best Conservative. And he was a quiet prankster. He might confuse voters by surreptitiously fixing ancient election posters onto strategic telephone poles. 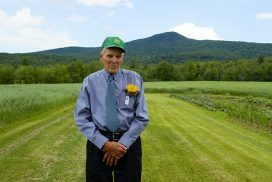 When he had a few extra gladiola bulbs, he enjoyed secretly planting them in flower boxes here and there – like at the Sutton Cantine, Le Cafetier, and the bank. He looked forward to their surprise appearance. 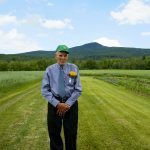 After Norma moved into assisted living in the village, he stayed alone in his mountain home, fixing his own meals, and managing heat with the massive kitchen stove built by the Bedford Foundry. His daughter Whitney, granddaughters Brittney and Megan and a wide variety of loving neighbours (including Boofie McCullough) brought meals, fresh baking, and conversation. He was adored. In his later years, his big old Pontiac might be seen parked outside Tim Horton’s in Cowansville. How it arrived there was a mystery, because his driver’s license had been restricted to a radius of 20 km from home – about three km short of Tim’s. He relished a coffee and doughnut with his buddies who welcomed him as “The Sherminator”, when he entered in his big, mirrored aviator glasses. Eventually, he, too, moved to the village. He lived in a ground floor apartment of a retirement residence. Outside the door, he could park his electric buggy, grow a few flowers, and mount a fine Christmas tree. His favourite day of the year was Canada Day. Every year, a hundred or more friends and neighbours of every age, would gather in his high pasture for a splendid array of desserts, the biggest bonfire of the year, and spectacular fireworks illuminating the mountain. On June 29th last, Sherman he suffered a sudden drop in blood pressure. He was persuaded with difficulty to go the hospital, where he died a few hours later, in a peaceful sleep. One would be fortunate to have known a better man. Coop Gym Santé Sutton: ça bouge!